The best thing you can do for your chairs and couches is to clean them regularly. This means vacuuming the surface with the upholstery attachment when you vacuum the carpets, and it also means having the upholstery professionally cleaned at least once a year. This may seem like it’s unnecessary, but there are actually several great reasons to have that couch steam-cleaned. It’s true that your carpet is walked on, but your couch also sees a fair amount of dirt. You come in from gardening outside with pants that are a little dirty and sit on the couch. The kids forget and put their shoes on the furniture. Pets hop up on the furnishings either because they’re invited or you aren’t home to catch them. Just the oils from your hands can gradually lead to staining on the arms, and that doesn’t even scratch the surface of crumbs, drink spills and other mishaps. The fact is that your couch may not be walked on regularly, but it’s still probably carrying more than a little dirt in the fabric. You may not like the thought of sitting on all that dirt, oil and gunk, but the problems go deeper. The dirt gradually stains and discolors your sofa. It leaves an odor behind, and it also damages the fabric. It wears the fibers down faster, and that leads to a shorter lifespan for your upholstered furniture. With regular cleaning, you can keep the smells away, avoid stains and make your furniture last longer. Have you been dealing with allergies that just aren’t getting any better? Do you have a strange odor in your home that you cannot identify? The culprit could be your favorite chair. Allergens sink into the fabric to irritate your allergies months after the season has passed. Stains, crumbs and animal hair can linger in the chair and start to leave an unpleasant odor behind. If you have been dealing with these problems, take the time to clean the upholstery. Simply vacuuming the furniture can remove a great deal of these allergens. Professional steam cleaning will reach deep into the fabric, remove stains and ensure that your upholstery looks incredible. 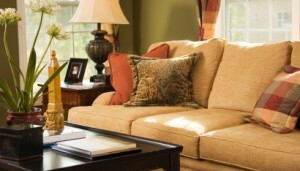 Another benefit of having your upholstery cleaned is that it will protect your fabric. Removing the allergens, dust and dirt preserves the fabric and avoids damage. You can also ask about having special protectors applied to prevent stains in the future. When you have beautiful furniture, you want to keep it looking incredible. Professional cleaners have powerful steam equipment that will remove stains and allergens while also drying the fabric quickly. Your furniture can look like new again, and it costs far less than a new couch or recliner. The results are impressive, and you will love how clean the furniture is and how great it smells. Call High Quality Carpet today to schedule an appointment to have your upholstery cleaned and treated.